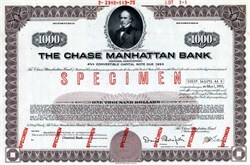 Beautifully engraved specimen $1000 Convertible Capital Note Certificate from the Chase Manhattan Bank printed in 1970. This historic document was printed by the American Banknote Company and has an ornate border around it with a vignette of an Salmon Chase. This item has the printed signatures of the Company’s Chairman of the Board, David Rockefeller and President, and is over 46 years old. JP Morgan Chase Bank, N.A., doing business as Chase Bank, is a national bank that constitutes the consumer and commercial banking subsidiary of the multinational banking corporation JP Morgan Chase. The bank was known as Chase Manhattan Bank until it merged with J.P. Morgan & Co. in 2000. Chase Manhattan Bank was formed by the merger of the Chase National Bank and the Bank of the Manhattan Company in 1955. The bank is headquartered in Columbus, Ohio, since its merger with Bank One Corporation in 2004. In 2008, the bank acquired the deposits and most assets of Washington Mutual. Chase offers more than 5,100 branches and 16,100 ATM's nationwide. JP Morgan Chase has 265,359 employees (as of 2014) and operates in more than 100 countries. JP Morgan Chase currently has assets of approximately US$2.6 trillion. JP Morgan Chase, through its Chase subsidiary, is one of the Big Four banks of the United States.